What do I wear? Interview attire and more! 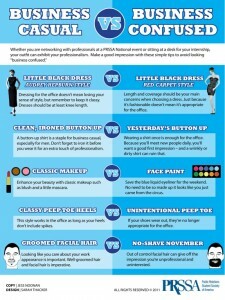 Ever wonder what to wear to an interview? Me too. Obviously, I can’t wear my new Pink yoga leggings and chestnut classic tall UGGs. An evening gown is too much. So what’s appropriate? All questions that any of us would ask, especially when interviews are being conducted for holiday hiring soon! Don’t go looking like you’re business confused! 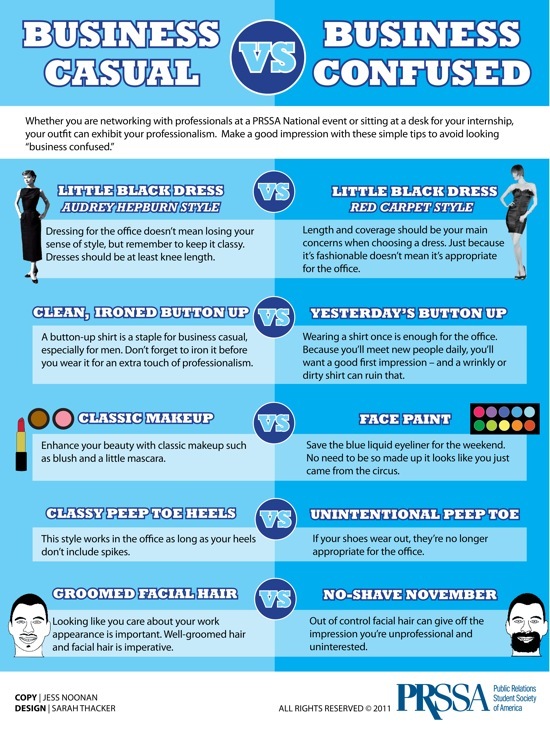 Here are some tips to help you look your best in business professional! If you have facial hair, keep it neatly trimmed. Potential employers DO NOT want to see you during no-shave November. Try to coordinate your tie color with your suit. Avoid the vibrant patterns – this isn’t a holiday party. Keep it simple. White socks are a no-no! Keep it dark, preferably similar to the shade of your shoes. Wearing Axe (or any other cologne) will not be pleasing to the person interviewing you! Shoes should be black or brown leather, whichever coordinates with your outfit best. Your shirt should always be lighter than your shoes. That draws the future employer’s attention upward, causing them to focus more on your face. Be conscious of your heel height. If you’ve ever worn it to a party, you probably shouldn’t be wearing it to an interview. Remember, flats are just fine! Try to avoid open-toed shoes. Pants should always be neatly ironed and lint-rolled if you have a pet. Skirt suits are just as good as pants! But they should never be shorter or longer than knee length. Make sure your jacket is the same color as your skirt. Neutral hosiery is a must if you’re wearing a skirt. Even have back-ups available at all times in case of that inevitable run. Frizzy hair is not attractive to anyone. You could even put it up in a neat bun, just to be safe. Go easy on the makeup! Just a little mascara and natural-looking eyeshadow is great. Under-accessorize! Everyday rings (minimalistic, of course!) are fine as well as an Alex and Ani or two. Remember that you don’t want to distract the interviewer from your past achievements! Avoid perfume! Deodorant is the only smelly thing you’ll need. For both guys and girls: bring a small briefcase with a notepad, pens, and an extra copy of your resume. If anything, it will give you something to do with your hands to keep from fidgeting. If you’re meeting with multiple people, bring multiple copies of your resume and one for yourself. Also, it can never hurt to have pre-written questions on a sheet of paper for your future employer. Trying to remember a bunch of questions while you’re under pressure is stressful and never really works out. In most places of work, business casual is the everyday attire. Remember to go by the office rules or if none are specified, ask your supervisor! Good luck and I hope this helps you in finding the right career!